Taking the place of the soon to disappear 10 year old, 12 year old Glenkinchie is a typical lowland whisky in that it is fresh and light in character, with notes of lemon and cut grass. A sweet nose and a hint of peat make this a good introduction to the world of single malts. South and East of Edinburgh lies the farming country of East Lothian. Here, at the heart of the farming community south of Tranent, since the early 18th century the barley had often been grown on land manured with local seaweed, ripened earlier and was lighter than grain grown elsewhere in Scotland - qualities that are now prized in the Lowland malts made from it. 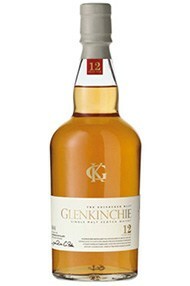 The Glenkinchie distillery was founded between 1825 and 1833 by the brothers George and John Rate. It is now part of the Diageo group. The malt is also used in blends, among others Haig, Johnny Walker Red and Black Label, Buchanan and Dimple. Today, with just two Lowland distilleries left in production (the other being Auchentoshan), Glenkinchie is a veritable ambassador of the elegant, floral Lowland style.